Here at Protein Pow, I’m all about pushing culinary boundaries. I don’t settle for blandness and my spirit of experimentation never wanes, even when I sometimes end up with disasters (like these ones!) I created Protein Pow to be a space full of recipes for foods that many people previously may not have thought were possible. So you kind of have to have an experimental and creative-verging-of-mad-hatter spirit, you know? Because that’s how you end up with things like… a super healthy pizza that tastes just as good as regular pizza? Done. Cookies and Donuts that are high in protein yet devoid of white flour, sugar, and butter? You got it. Decadent cakes that taste ‘sinful’ but are full of protein and brimming with vitamins, minerals and fiber? No Problemow! 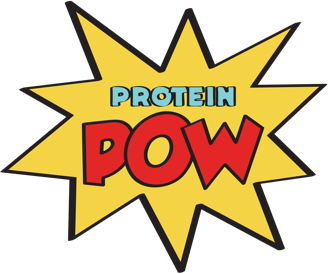 Protein Pow is all about making healthy eating fun and exciting, without ever compromising taste or the enjoyment-factor of food. At the core, it’s about having your cake – and devouring it too! It’s about tearing down the boundaries between what is and is not possible in the land of healthy eating. That’s why I created the Protein Pow Recipe Vault. It lives in the Protein Pow Forum. I created it to make you guys dream big and to see if, together, we can give your favorite foods a healthy high-protein makeover – so that you can enjoy them with gusto and fit them into your diet without ever feeling an ounce of guilt or a hint of ‘I shouldn’t have’. This recipe was requested by Sarah in the Protein Pow Recipe Request Vault. Here. She asked for Gluten-Free and Dairy-Free Protein Crackers. This recipe is my answer. Please note that if you, like Sarah, want to end up with completely dairy-free crackers, you can. Just substitute the cheddar with sun-dried tomatoes, chopped olives, and/or caramelized onions!